Adlib Adventure: You decide what monsters and treasures will be found… and Frank creates an adventure on the spot. Anything can happen! I was very curious to see Frank improvise an entire adventure, and I wasn’t disappointed. Now, Frank’s style is a bit more serene than Bill Webb’s, which I think is also largely improvised, but it was quite interesting. 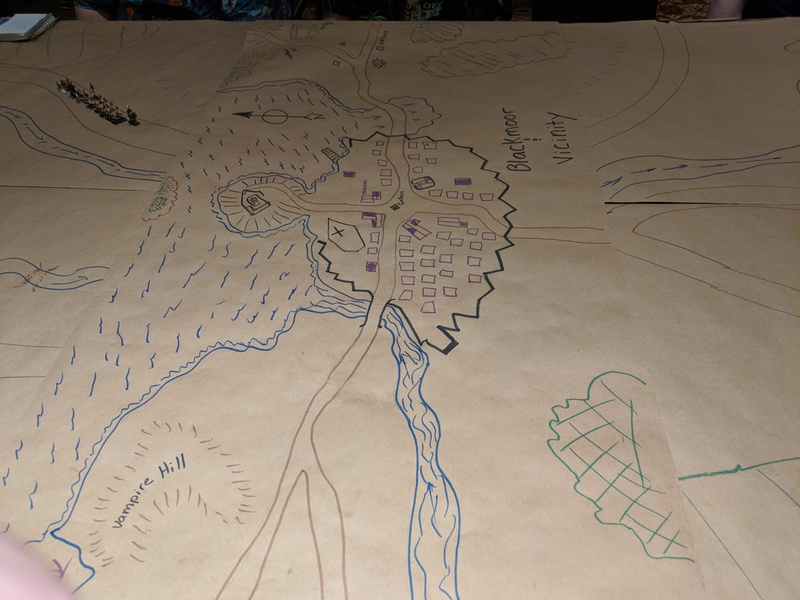 He had a standard party of adventurers ready to go and had each of us write a person, place, or thing on a piece of paper. He then took a 10 minute break to whip up an adventure based on our input. My own item wasn’t terribly inspired, just the first thing that popped into my head: the world’s largest ball of twine. Others though would steal the show. The adventure started with us being summoned by the king as all of reality was shifting and unwinding. Mountains flickered in and out of existence, everyone was walking around nauseated. We were going to be teleported to the immortals to see if they knew what was going on. So we gather together, they incant the ritual, and then we’re standing around on the street outside the TSR headquarters in Lake Geneva in 1980. Turns out the gods (Gary Gygax, Tim Kask, and Frank Mentzer) are having a meeting discussing two alternate realities (Basic D&D and AD&D). This was apparently an actual meeting that happened, as they were in the middle of publishing both the AD&D books and the Moldvay basic set, and they were having trouble keeping it all straight. Thus in their confusion they were screwing up the reality from which we came. All this came from a suggestion of incluing in the game “you – Frank Mentzer”. It was a pretty good hook – we then had to travel into three different modules where various mistakes were made and sort them out. At one point we fought some undead who begged to be killed and thanked us when we dispatched them. This from the suggestion of “the Grateful Dead”, was interpreted as a Gygax style pun very likely to show up in a module of that period. But the real highlight was watching Frank roleplay as himself, Gary, and Tim. Were we playing a game with Frank, or helping him with his therapy? After that game I raced down to the Legends of Wargaming room to play a game of Dungeon! by its creator, Dave Megarry. 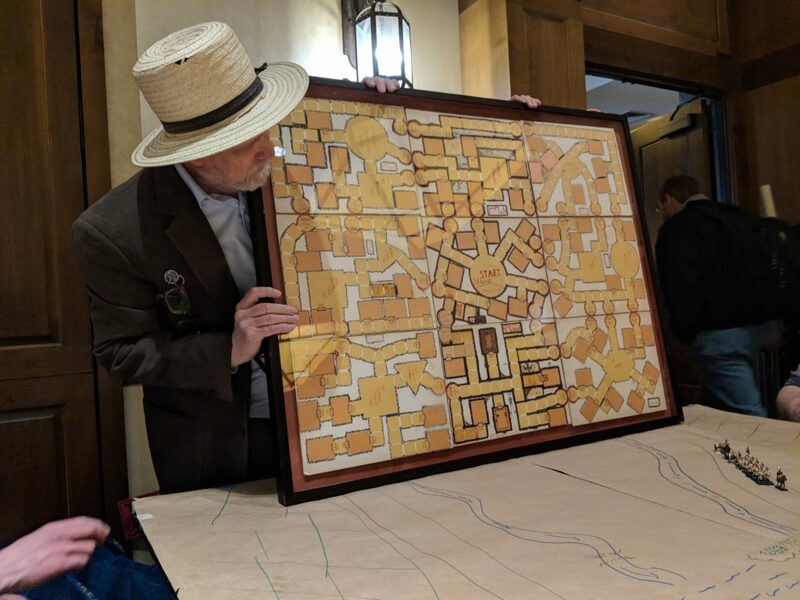 The game was played on Dave Arneson’s actual basement ping-pong table where Blackmoor was first created, which Megarry had set up just as it would have been back then, with brown paper terrain and a troop of miniatures on it. Megarry then gave a really nice presentation on the invention of Dungeon!, for which he had many really nice actual artifacts on hand, such as the original rejection letter from Parker Brothers, and the original board now nicely framed. I learned some really interesting tidbits, like the fact that two follow-up games had been planned called Castle! and Kingdom! Man, I would love to have seen those games come to life. After the presentation we broke into groups and played a round of Dungeon! I played with two other players and am happy to say that I trounced them. I suppose it didn’t help that I’ve played the game a lot while both of these fellows had never played. Whatever, eat it newbs! I then had a nice long break from 4-7 before my evening game. I checked out the dealer’s hall, and then hooked up with Delta. He was waffling on what to do with his evening, and how to make sure he got some dinner. It was too early right now, but he had to check back at 6 to see if he made it into the jousting finals, and if so he wasn’t sure if that would interfere with the 7 PM game we were schedule to play. What was that 7 PM game? I don’t even remember, because it was then that we hatched our brilliant plan. We gave the jousting guys Dan’s number to text if he got in, and we we went off to dinner. We decided to blow off our 7 PM game, and see if we could drop into Bill Webb’s Mythrus game at 8. It went perfectly. I won’t mention more about Dan’s jousting outcome yet, I don’t want to steal his thunder if he’s posting about it on his own blog. But as mentioned earlier by 7:30 we were in place and ready to muscle into the Mythrus game. Bill Webb was very gracious and made room for us. Arriving half an hour early we even managed to get prime seats at the table, and were warned that it was going to be an intense game. This is the “high level” game Bill and his regulars told us, so look out! That doesn’t mean we get high level characters, just that those who had them could bring them. The rest of us were to act as door openers and cannon fodder. Did they think they might scare us off? It sounded glorious to me. In fact, this game was a bit more even keeled than Friday night’s. I think the gang was starting to feel the effects of the sleep deprivation. I’m pretty sure some of them played from 8 AM to 1 AM the day brefore, and then returned at 8 AM again the next morning (is it the next morning, or just the same morning?). Yeah Dan, I do think this is a cult. The highlight was the hobbit artillery. A pair of new players created two hobbit fighters, and were incredibly enthusiastic about chucking rocks from the back row. I was also playing a hobbit fighter so joined in, and then a fourth hobbit player filled out the ranks of the hobbit artillery. Later, when facing off against a monster with mind control, the high level player to my right failed his save and started acting against the party. I was next, so I yelled “dog pile!” and jumped on top of him. As every other player would get a turn before his came around again, I was hoping I could make use of our massive numbers (22 this time), but the other players weren’t biting. I chided them, and then when the two new hobbits came around, they gleefully joined in. Bill delightfully mimed this player struggling to move under a pile of wriggling hobbits. And that was my last game of the convention. I was scheduled to play Nuclear War at 8 AM the next morning, but between staying up late (1 AM again), losing an hour to daylight savings, and knowing I would lose another hour to the time difference flying home the next day, I decided there was no way I was going to make it. Dan dragged himself out of bed, and I congratulated myself for my decision when he later reported that the GM failed to show. 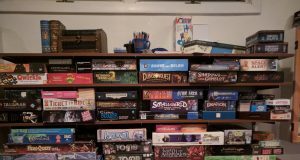 I think that about wraps it up for my GaryCon experience. I’m sure I’ll have some more related thoughts to post. I definitely want to write some more about Bill Webb’s games – playing with 20+ players is a fascinating concept that I would never have thought to try, but I suspect is about the most old school thing I did all weekend. 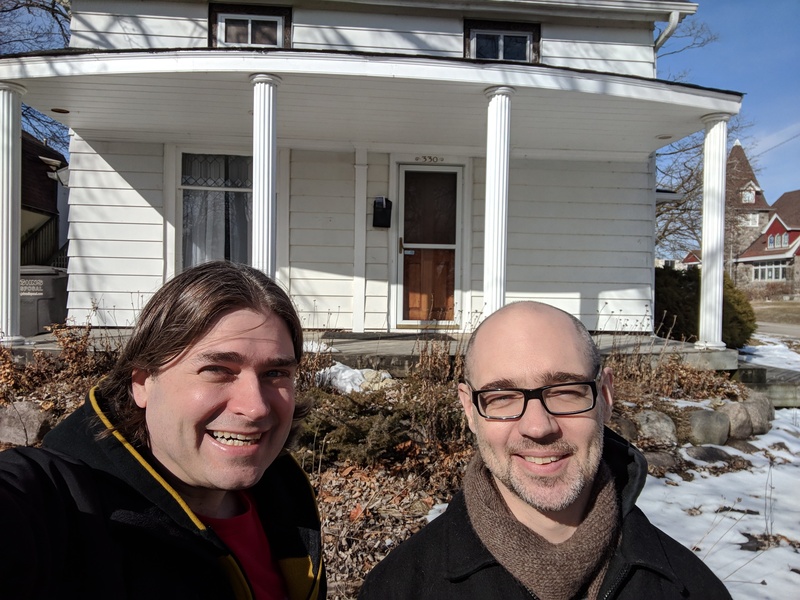 For now though, I’ll leave you with this, a photo Dan and I took on our way back to the airport of us in front of 330 Center St, former home to Gary Gygax and the birth place of Dungeons & Dragons. Before leaving for GaryCon, I emailed myself the address just in case an opportunity came up to visit. So when Dan mentioned hitting it on the way to the airport I was all ready for it, and dropped it into the GPS. We hit the site, took a couple pictures, got back in the car, and it wasn’t until I was on the airplane when the thought struck me – what if that was the wrong house?